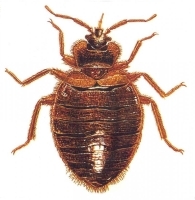 Effective treatment of bedbugs requires servicing all areas where these pests may hide. It also requires a high level of cooperation from the customer. Without complete customer cooperation, effective treatment is impossible. Clean out all dressers, nightstands, wardrobes, closets, etc. Leave drawers removed from furniture. Clothing should be washed and dried (on high heat) and then placed in sealed plastic bags or garment bags. Do not put back into the dressers, closets, etc. Purchase and install mattress covers designed for bedbug control on all mattresses and box-springs. Mattresses and box-springs should be left standing against a wall. Run all draperies, curtains, pillows, and bedding (sheets, blankets, bedspreads, etc.) through the dryer on high-heat. Do not re-install until after the first treatment has been done. Reassemble beds, leaving mattress covers installed on the mattresses. Beds should be positioned so that they are not in contact with walls or any other furnishings.